Massage a few drops of serum in the morning and in the evening on cleansed face, neck and décolleté area or directly on problematic spots of skin. 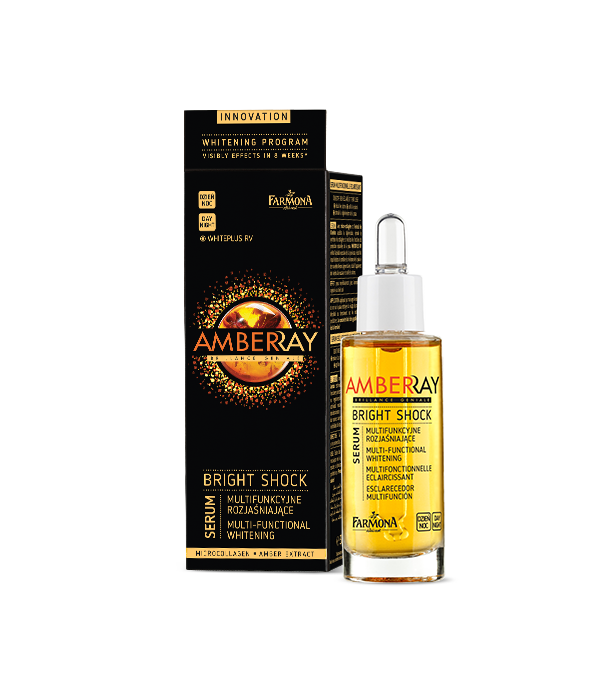 Apply independently or as a base for Amberray day or night cream. Store the concentrate away from daylight! Amber extract, microcollagen, WHITEPLUS RV. Aqua (Water), Propylene Glycol, Glycyrrhiza Glabra (Licorice) Root Extract, Glycerin, Arctostaphylos Uva Ursi Leaf Extract, Panthenol, Citrus Limon (Lemon) Fruit Extract, Butylene Glycol, Rubus Fruticosus (Blackberry) Fruit Extract, Palmitoyl Tripeptide-5, Undecylenoyl Phenylalanine, Polysorbate 20, Amber Extract, Triethanolamine, Phenoxyethanol, Ethylhexylglycerin, Acrylates/C10-30 Alkyl Acrylate Crosspolymer, Disodium EDTA, Potassium Sorbate, Sorbic Acid, Parfum (Fragrance), CI 19140, CI 16255.